One of the more interesting things that has been occurring in the precious metal sector is how extreme the sentiment is and has been for gold and silver over the past few months. On one hand we found that sales of gold to retail investors in the first quarter was extremely low, but on the flip side central banks and some large institutional investors were quietly buying large amounts behind the scenes. 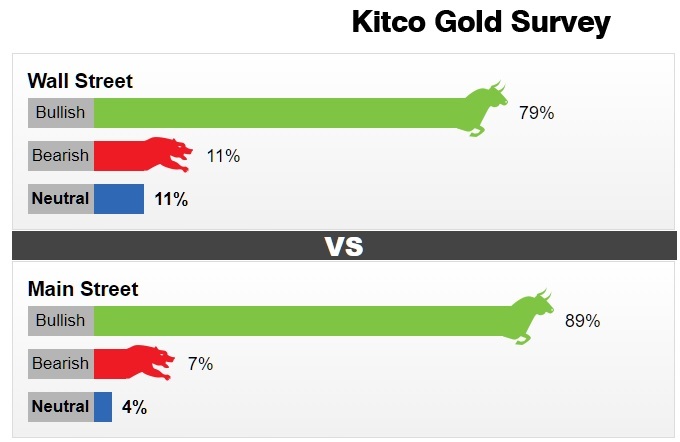 And perhaps now that we have begun Q2 the sentiment for everyone may suddenly be coming in synch as the latest weekly survey from Kitco is showing a positive outlook for gold from both the large investor, as well as the Mom and Pop trader. The traders and analysts who take part in the Wall Street poll cite mostly technical-chart factors – in particular, gold’s ability to hold around the 200-day moving average and the psychologically important $1,300-an-ounce level during a recent price pullback. They also suggest the U.S. dollar’s recent strength may be waning. Nineteen market professionals took part in the survey. Fifteen of the respondents, or 79%, called for gold prices to rise over the next week. There were two votes each, or 11%, calling for gold to fall or be sideways.